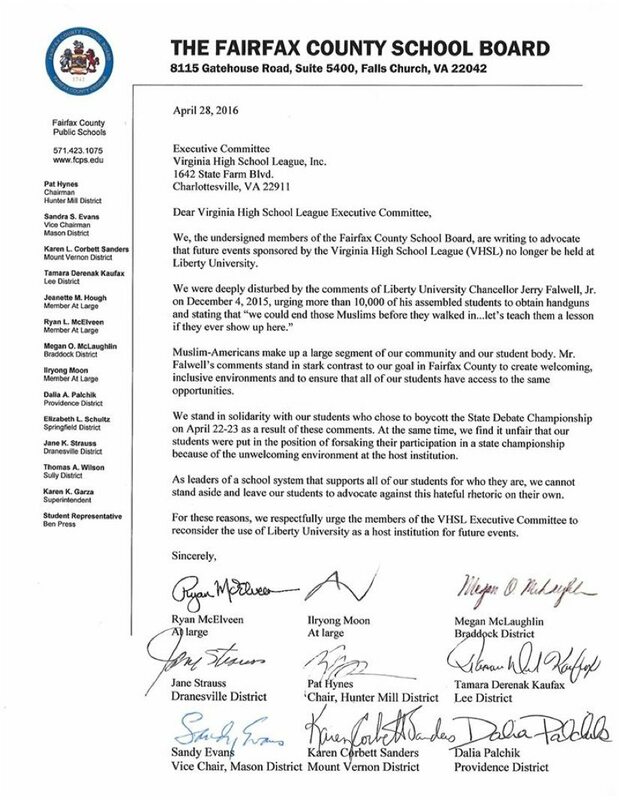 Nine members of the Fairfax County School Board are urging the Virginia High School League (VHSL) to stop holding events and competitions at Liberty University in Lynchburg. 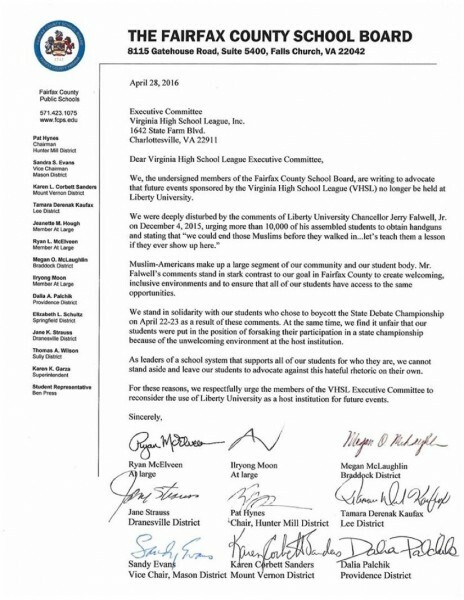 Two weeks ago, several Fairfax County Public Schools students boycotted the VHSL Debate Championships at the Christian University. The students said they were protesting remarks by made by Liberty University president Jerry Falwell Jr. that they perceived to be anti-Muslim. At a convocation in December, Falwell urged students to obtain concealed-carry permits and arm themselves so they could “end those Muslims.” Falwell later said he was referring only to the Islamic terrorists who killed 14 people in December in San Bernardino, Calif., not all Muslims. Hunter Mill school board representative and school board chair Pat Hynes was among the school board members signing the letter, which says school board “stands in solidarity” with the protesting students. “We were deeply disturbed by the comments of Liberty University Chancellor Jerry Falwell Jr. on Dec. 4, 2015 urging more than 10,000 of his assembled students to obtain handguns and stating “that we could end those Muslims before they walked in … let’s teach them a lesson if they ever show up here,” the letter reads. Upcoming VHSL events scheduled for Liberty University include Region 3A/4A soccer, softball and tennis finals this June. Northern Virginia schools are in Regions 5 and 6. No word on whether the schedule will be altered or whether any more protests are planned.